Mitchell the pig was tagged to 83! Ben Jacobs will have his turn on him this week. Calvin…. help! WE’RE IN ADELAIDE – COME SEE US! Yep, it’s not too late to get tickets to our LIVE Show and come along to have a beer and a Fantasy chat with myself and the other lads. I’ll be in the green vest, to make it easy for you to find me. On Saturday night… we’ll be at Adelaide Oval to see Rocky (who is coming to our show) taking on Patrick Dangerfield. Danger was awesome last week scoring 52 in the first quarter but only 28 in the last half to finish the day with an iced-up calf and just 97pts. Precautionary I believe but I don’t know for sure. He scored 125 on the Power last year and 115, 90, 120 and 113 before that. He loves playing in Adelaide and has scored 112, 129 and 115 there since joining the Cats. Joel Selwood hasn’t scored a ton for the last two weeks but posted 122 and 134 on port in his last two runs. After having 93 in his comeback game, Mitch Duncan should be better for the run and has scored well against Port in the past with 109, 110 and 101. Running hot is Sam Menegola with 118 and 120 in his last two but the one to keep an eye on here for your Moneyball teams is Zach Tuohy. Hurley claimed 15 marks on the Power last week and just might be the guy to cash in here if they are letting him roam free across that backline. Ok, so last week our beloved Tom Mitchell was tagged and tagged superbly (if there is such a thing) by Nathan Jones who held him to 83. Many of us thought that this would be Vince, but it wasn’t and he was convincingly dominated by the veteran. This week, he will be tagged again by Ben Jacobs… so let’s break this down and dig deeper into what will go down on Sunday afternoon. North Melbourne Tagged him in 2017: Yes they did. Not with Jacobs though because he was injured but with Trent Dumont. This indicates that the tag will be happening again but with Jacobs. Ben Jacobs is a Pure Tagger: What I mean by this is… it’s his sole role. He tags and tags hard and doesn’t need to win his own ball. So far this year he has claimed Cripps (76), Oliver (88), Ross (91) and Lyons (84). Although none of these guys achieved their average, they still actually scored reasonably well, well enough not to score something really dirty. When he was Tagged in 2017: Mitchell was tagged four legit times last year for scores of 120 (Libba), 143 (Kerridge), 118 (Dumont) and 99 (Prestia). The Pig is Under the Roof: Mitchell only played under the roof on two occasions last year and those were the games above when he was tagged by Libba (120) and Kerridge (143) in the final two games of the year. The Marking Concern: When he was tagged last week, he didn’t take a single mark. These uncontested marks turn a big score to a pig score. The last time this happened was back in round 18, 2016. Over the last two weeks when Ben Jacobs has been tagging, he has held Cripps and Oliver to only 3 marks between them. Last week, Cripps just took one mark and prior to that, he was averaging 5 a game, which is the same as Titch before last week’s zero. The Hawks Won: Hawthorn didn’t need Titch. When he was being tagged, others stood up around him and I’m tipping they are perfectly happy with this. O’Meara got busy with 26d and 2 goals while Liam Shiels racked up 31 of his own. Will the Hawks be concerned about Tom being tagged this week? Unlikely if the others can step up and dominate like they did when they thumped the Demons by 77pts. Midfielders Struggle v North in 2018: From the midfielders who have played North Melbourne this year, only Jack Steven (112), David Swallow (111) and Nathan Jones (106) are the only ones to score triple figures on them. But with that said, they haven’t really had a tough crew to play against have them? Carlton 18th, St Kilda 16th, Gold Coast 14th and Melbourne 12th. It’s the pig and main issue here is… we really have no one else as a huge stand-out option. Danger only scored 28pts in the second half last week with ice on his calf. Merrett can’t be trusted as far as you can kick him off the back of one good game. No gun rucks have what you’d call an easy game. Gibbs is at the SCG v Sydney. Dusty might cop a Nathan Jones tag this week like Titch did. Grundy’s record v Essendon isn’t great and list goes on and on. He has been so good to us for such a long and consistent period of time. He has a snout. Although, this would be the perfect time to jump off him after having 83 last week, it’s also the time to stay strong. ANZAC Day Football is one if the greatest things ever. If you’ve never been to a game, put it on the “Bucket List” and be sure to get there soon. The #1 man in the game based on form will be there by the name of Brodie Grundy who has averaged 131 over his last 3 games. The issue is… Essendon are the only team he has failed to score a ton on and that’s after 7 games against them. Surely that changes here but the stats suggest otherwise. Essendon are the 4th easiest team to score on at the moment and #1 when it comes to giving up 100+ scores. This indicates that Adam Treloar should be great. 57, 144, 129, 102 and 130 are his last five against the Bombers and that 57 wasn’t a tag, just a poor game. Steele Sidebottom scored 108 and 90 on the Bombers last year and has been in ripping form scoring 137 and 130 over the last two weeks. Then we have Zach Merrett. What can we say… is he back or was he just tricking us? He scored a very nice 121 on the weekend after being below average for the first part of the year. He scored 105 and 137 on the Pies last year and should run tag-free on Wednesday afternoon. Luke Parker v Adelaide @ the SCG: 87 last year on the Crows and just 71 and 97 at the SCG this year. Dayne Zorko v Gold Coast @ the GABBA: A career-high 181 on the Suns last year has me excited. His form though… not exciting. Still… no tag coming here and although he’s dropped $145K, he should bounce back. Dusty Martin v Melbourne @ the MCG: You’ll be waiting till Tuesday night to see this game but will Nath Jones continue to tag this week and target Dusty? Good luck, cause Dusty will take him forward and kick a bag like he did last week for his 111. He scored 125 on the Demons last year. Bryce Gibbs v Sydney @ the SCG: 113 last week was his equal lowest score for the year and last week against the Swans, Macrae (128) and Dunkley (117) scored with ease. Patrick Cripps v West Coast @ the MCG: Amazingly, Cripps has only played the Eagles once in his career (109pts) which is strange considering he has played the Pies 6 times. Lachie Neale v Bulldogs @ Optus Stadium: 88 last year against the Dogs. At home though and will be better. Sam Jacobs v Sydney @ the SCG: If English can score 90 on the Swans, Jacobs can go much bigger. Had 106 on them last year. Josh Kelly v St Kilda @ Etihad Stadium: 111 on them last year for those who held after his injured groin. A risky option would be putting it nicely here. Rory Laird v Sydney @ the SCG: 38 touches last week and carries a lowest score of only 115 this year. Had 116 on the Swans last year and should be huge once again. Nat Fyfe v Bulldogs @ Optus Stadium: 91 last week but is still averaging 119 in his last three. Posted 110 on the Dogs last year. Rory Sloane v Sydney @ the SCG: 46 and 67 in his last two games, however, this will be different. No tag coming here just like in the past when he has scored 153, 109 and 112 on the Swans. Stephen Coniglio v St Kilda @ Etihad Stadium: Saints are the 3rd easiest team to score against and Cogs has given them a touch up in the past with scores of 115, 123 and 132. I really really like him this week! Maybe a tag by Dunstan, but I strongly doubt it. Jack Macrae v Fremantle @ Optus Stadium: #2 man in the game based on form averaging 126 in his last three. Freo are the second easiest team to score against but they have a tagger… Banfield. He has kept Whitfield (66) and Hall (14) very quiet in recent weeks and will tag again. Macrae or Bont? Dayne Beams v Gold Coast @ the GABBA: 143, 103 and 119 are his last three scores against his favourite team to score against and this one is at the GABBA. Form hasn’t been great but surely this will be a turning point. NEW LOOK TOP 5 – It’s not a top 10. As requested, I will now extend my top 5 to benefit not only those who wonder what is next, but those who are looking at a trade option or a Draft captain. 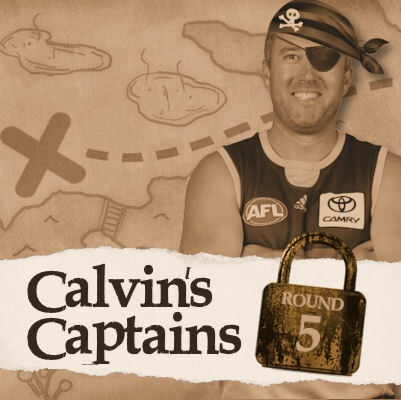 You speak, Cal listens… he’s the people’s pirate. Cheers for the article Cal, helps us all out a lot. What do you see these blokes averaging for the year? Interesting Read…. no mention of Stef Martin? J bomb. Left of center I know. But seeing as thou titch will get attention again. Hawks will flog roos. So J bomb should kill it. 30+ pills, a couple of snags, some marks and a host of +4’s…….130-150. Lock it in Eddie. I like a gamble now and again lol. He’s building nicely JOM. Best 430k spent all season. Cogs for sure this week, should shred against Saints. Looking likely Kelly is out this week, more points for Cogs! Hopefully Titch proves me wrong and gets a 150, still happy to take that! Sneaky captain if I had him, Josh Kennedy could kick a bag vs Carlton this week going to be unstoppable. If your burning a trade getting in a RUC bench to move him FWD probably not worth it, just check the teams but word is Roughhead might be in this week which will hurt English scoring. If he is solo ruck might be worth it. IMO it’s not a good plan. Thanks! Looks like I’ll trade Fritsch when I’d likely hold if I knew teams and he was named. Cogs for me this week he’ll kill the saints. Jacobs to much of a worry to risk. Is there a partial lockout this week? I think it’s a standard full lockout on Friday … which is pretty ridiculous given that the round doesn’t end until next Wednesday. And I read earlier this week (in an article about the Demons’ and Tigers’ extra long break and preparations for their Tuesday match) that their squads don’t even have to be announced until Monday! And if that’s so, then presumably neither would the Pies and Bombers? Which begs the question – why have we heard nothing from our friendly Fantasy experts about how this round will work? Please Calvin, could you & the Traders give us a shout out re lockout and various team announcements over this looooong round? How was Gawn not in the top 10? Rookie error Pirate. I’ll take big Maxie’s double points though!